This guide gives a brief overview of Mazinbiige Indigenous Graphic Novel Collections, its history and information on the collection. This November 13, 2013 UM Today article by Katie Chalmers-Brooks highlights the collection's opening celebration. This January 11, 2014 CBC article by Niigaanwewidam Sinclair discusses the portrayal of indigenous people in comic books, using examples from Mazinbiige. In this December 21, 2013 article in the Winnipeg Free Press, Roberta Bell writes about Niigaanwewidam Sinclair's hopes for the Mazinbiige Collection. This May 1, 2015 Ad Astra Comix blog post by Hugh Goldring highlights the importance of the collection. Camille Callison participates in a roundtable discussion on indigenous comic books. Mazinbiige Indigenous Graphic Novels Collection was developed by the first Indigenous Library Services Librarian, Camille Callison, and is located in the Reserve area at Elizabeth Dafoe Library, will provide students with an unconventional way to explore Indigenous stories and combat stereotypes. 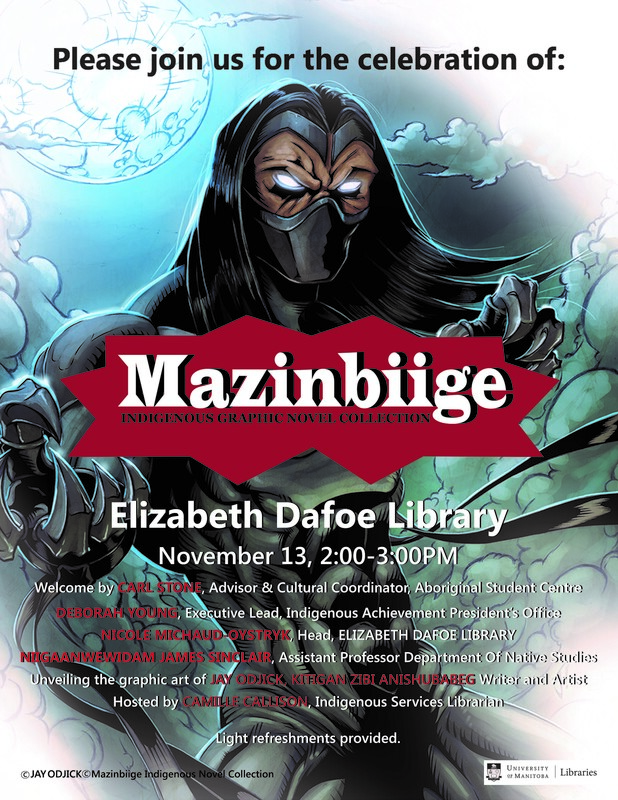 Mazinbiige Indigenous Graphic Novel Collection launch took place on Wednesday, Nov. 13, 2013 at Elizabeth Dafoe Library located on the Fort Garry Campus of the University of Manitoba. The Mazinbiige Indigenous Graphic Novel poster is of Kagagi from the comic Kagagi: The Raven illustrated by Jay Odjick, a writer and artist from the Kitigan Zibi Anishinabeg community. Jay worked as a producer, designer and writer on the animated television series based on Kagagi which aired on APTN. “Mazinbiige Indigenous Graphic Novel Collection houses titles about Indigenous people with many written and/or illustrated by Indigenous authors and illustrators that use the comic book format to tackle some heavy subject matter. They have a place in writing and they address many serious issues in our community, including bullying, suicide, AIDS and residential schools, etc. 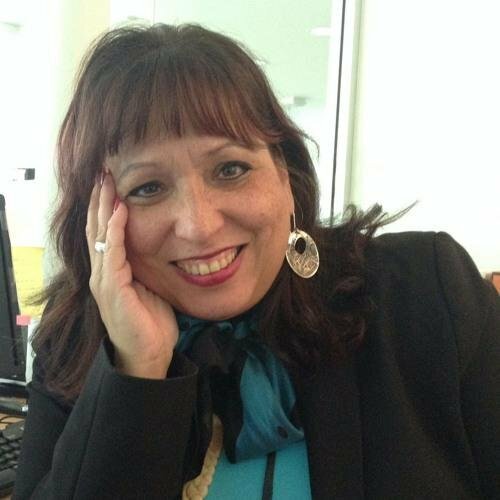 The items are a mix of ‘the good, the bad and the ugly’ of work in this genre as are appropriate in their description of First Nations people and then there are the stereotypical renditions of Indigenous peoples where they are not portrayed accurately or respectfully.” Camille Callison, Indigenous Services Librarian and founder of the Mazinbiige Indigenous Graphic Novels Collection. The Mazinbiige collection (Mazinbiige is an Anishinabe word meaning beautiful images and writing) supports an Indigenous graphic novels course developed by assistant Prof. Niigaanwewidam James Sinclair and taught for the first time more than a year ago. The course, offered again in January, challenges students to analyze various works and also write their own; three of them have since published their graphic novels. The graphic novel genre is gaining legitimacy in literature, Callison says. Written by Indigenous authors, graphic novels are addressing some critical issues in Canada today and offering an engaging medium for teenagers and young adults to explore.